If you’re a big fan of teeth whitening, but are apprehensive because of the expensive dental costs, Colgate may have a solution for you. 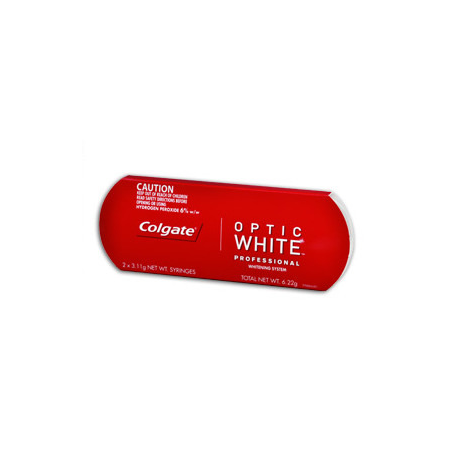 Colgate Optic White is the same whitening gel used by the professionals themselves. Most over-the-counter whitening gels cannot go stronger than 10% carbamide peroxide, which is about the same as 3% Hydrogen Peroxide, a stronger faster whitening agent. Colgate Optic White comes in 7-9% Hydrogen Peroxide, meaning this gel is 2-3x stronger than the leading over-the-counter brands! With Colgate Optic White, you get a faster whitening experience than anything in the stores and at a fraction of the price you would pay at the dentist! Keep out of reach of children. Keep at room temperature. Avoid prolonged exposure to temperatures above 90 degrees Fahrenheit.